Austin, Texas has become synonymous with no kill success. While Austin Animal Center exceeded the 90% live release rate some people consider as being no kill in 2012, the shelter’s live release rate increased sharply in 2016. The shelter’s success in 2016 was spearheaded by Director of Animal Services, Tawny Hammond, and Deputy Chief Animal Services Officer, Kristen Auerbach, both of whom came over from Fairfax County Animal Shelter in Virginia. Hound Manor performed a fantastic analysis of Austin Animal Center’s 2016 results. This analysis utilized various computer programming techniques to extract incredibly useful data from Austin’s open public data on its web site. While I don’t have the skills to replicate such an analysis, I was able to obtain some key data I frequently use in my New Jersey animal shelter analyses. Using this data, I did an analysis of Austin Animal Center’s 2017 results last year. This data showed the shelter achieving extremely high live release rates for cats, dogs, pit bulls, young kittens and other types of animals. Tammy Hammond left Austin Animal Center in May 2017 to join Best Friends and Kristen Auerbach resigned in July 2017 to take over Pima Animal Care Center in Tuscon, Arizona. How did Austin Animal Center perform in 2018? Did the shelter continue its success without two of its key leaders? Austin Animal Center saved virtually every dog that arrived in 2018. You can find a link to the data I used here. Overall, only 1.2% of all dogs, 1.1% of pit bull like dogs, 1.5% of small dogs and 1.0% of other medium to large size dogs lost their lives or went missing at the shelter. The death rates for all dogs and other dogs decreased by 0.1% and 0.2% from 2017 while pit bulls’ and small dogs’ death rates remained the same as in 2017. Even if we only look at dogs who were not reclaimed by owners, only 1.6% of all dogs, 1.8% of pit bulls, 2.1% of small dogs and 1.3% of other medium to large size breeds lost their lives or went missing in 2019. Thus, Austin Animal Center saved almost every dog it took in last year. Austin Animal Center’s pit bull numbers are especially noteworthy. Despite taking in 1,930 pit bull like dogs in 2018, Austin Animal Center saved 99% of these dogs. On a per capita basis, Austin Animal Center impounded 1.6 pit bulls per 1,000 people compared to my estimate of New Jersey animal shelters taking in just 0.8 pit bulls per 1,000 people from the state. In other words, Austin Animal Center saved 99% of its pit bull like dogs even though it took in twice as many of these dogs on a per capita basis as New Jersey animal shelters. Similarly, Austin Animal Center adopted out 0.7 pit bulls per 1,000 people compared to the 0.5 pit bulls per 1,000 people New Jersey animal shelters would need to adopt out to achieve a 95% dog live release rate. Furthermore, Austin Pets Alive and other local rescues adopt out additional pit bulls in the Austin area. As a result, Austin Animal Center’s results prove New Jersey animal shelters can do a far better job with their pit bull like dogs. Austin Animal Center also had amazing cat numbers. Overall, only 4.4% of all cats, 5.9% of adult cats, 1.9% of kittens 6 weeks to just under one year and 7.0% of kittens under 6 weeks lost their lives at Austin Animal Center in 2018. As compared to 2017, the all cats’, adult cats and neonatal kittens death rates decreased by 0.9%, 1.3% and 1.5% while the older kittens death rate remained the same. Even if we exclude cats who were reclaimed by owners and placed through the shelter-neuter return program, only 5.4% of all cats, 9.5% of adult cats, 2.1% of kittens 6 weeks to just under 1 year and 7.0% of kittens under 6 weeks lost their lives in 2018. Thus, Austin Animal Center saved almost all their cats of all ages. The table below lists the reasons Austin Animal Center used to euthanize dogs in 2018. As you can see, 74% of the euthanized dogs were due to severe medical reasons (i.e. suffering, at veterinarian). Austin Animal Center limits behavioral euthanasia to truly aggressive dogs. Hound Manor’s blog on Austin Animal Center’s 2016 data found the shelter euthanized a similar percentage of dogs for behavioral reasons in the final quarter of fiscal year 2016 as the No Kill Advocacy Center targets (i.e. under 1%). As you can see below, Austin Animal Center only euthanized 0.10% of all dogs for behavioral related reasons (i.e. aggression, behavior, court/investigation). Even if we add rabies risk and none, Austin Animal Center would have only euthanized 0.14% of all dogs for behavioral reasons. Thus, Austin Animal Center limited behavioral euthanasia to truly aggressive dogs. Austin Animal Center also reduced the number and percentage of dogs euthanized for rabies risk. As Hound Manor mentioned in its blog, few dogs killed for rabies testing end up having the disease. In fact, the New Jersey Department of Health’s guidelines state shelters should not euthanize dogs for rabies unless they have clinical signs of the disease. Austin Animal Center euthanized two dogs (0.02% of all dogs) in 2018 for rabies risk compared to the five dogs (0.05% of all dogs) from 2017 and 14 dogs (0.14% of all dogs) reported by Hound Manor in fiscal year 2016. The shelter also limited behavioral euthanasia for pit bull like dogs to truly aggressive animals. Austin Animal Center only euthanized 0.05% of all pit bulls for aggression, behavior and court/investigation reasons. In fact, this number was only one half of the percentage of all dogs euthanized for behavioral related reasons. In other words, pit bull like dogs were significantly less likely to be aggressive than other similar size dogs. Most of the rest of the pit bulls euthanized were suffering (0.41%). 0.1% of pit bulls (two dogs) were euthanized “at veterinarian” or for “medical reasons”, but its quite possible these animals were also hopelessly suffering. When you couple this data with the results of a recent study showing severe dog bites did not increase after Austin implemented its no kill plan, it proves shelters can in fact safely adopt out large numbers of pit bull like dogs. Austin Animal Center’s reasons for euthanizing small dogs followed this same pattern. The shelter euthanized no small dogs for aggression and other behavioral reasons. Given small dogs do not pose a serious danger to adult people, this is exactly what we should see at every shelter. Almost all the other small dogs were euthanized for severe medical issues (i.e. suffering, at veterinarian). While two dogs did not have a reason for their euthanasia, its possible they could have been hopelessly suffering. The shelter also only euthanized other medium to large size dogs for legitimate reasons. Austin Animal Center only euthanized 0.18% of other medium to large size dogs for behavioral related reasons (i.e. aggression, behavior, court/investigation). Even if we add rabies risk and none, Austin Animal Center would have only euthanized 0.22% of all other medium to large size dogs for behavioral reasons. Almost all the rest of the other medium to large size dogs were euthanized for severe medical problems. The table below lists the reasons Austin Animal Center used to euthanize cats in 2018. As you can see, around 90% of the euthanized cats were due to severe medical reasons (i.e. suffering, at veterinarian). While 4% of the euthanized cats and 0.1% of all cats who had outcomes cited “medical”, its possible these were severe medical issues that warranted humane euthanasia. Similarly, Austin Animal Center’s very low numbers of cats euthanized for no documented reason (2 cats, 1% of euthanized cats and 0.03% of all cats who had outcomes) may indicate clerical errors rather than the shelter killing cats for no good reason. Most impressively, Austin Animal Center did not kill a single cat for behavior or aggression or for being underage. Austin Animal Center also euthanized few cats for rabies risk. As Hound Manor mentioned in its blog, few animals killed for rabies testing end up having the disease. Austin Animal Center euthanized 11 cats (0.18% of all cats who had outcomes) for rabies risk in 2018 compared to 7 cats (0.11% of all cats who had outcomes) in 2017 and 23 cats (0.34% of all cats who had outcomes) reported by Hound Manor in fiscal year 2016. These statistics indicate Austin Animal Center pretty much only euthanizes hopelessly suffering cats. Given shelters should never kill cats for aggression or behavioral reasons, this is an incredible achievement since Austin Animal Center impounded 6,036 cats during the year who had outcomes. Austin Pets Alive has been a major reason the community achieved no kill status. Historically, this organization pulled animals directly from the kill list at Austin Animal Center. In other words, instead of cherry-picking easy to adopt animals like many rescues do, Austin Pets Alive takes on the most difficult animals. As a result of taking on these tough cases and the organization’s strong desire to make Austin no kill, Austin Pets Alive developed and implemented a host of cutting edge programs. Examples, such as dog playgroups, a Canine Good Citizen training and certification program and large scale fostering help save the lives of large dogs that are most likely to lose their lives in shelters. Other programs, such as parvo and ringworm treatment and barn cat placements save vulnerable animals. In addition, Austin Pets Alive’s owner surrender prevention program helps owners keep animals and avoid giving them to Austin Animal Center. Thus, Austin Pets Alive has historically focused on its community to help Austin Animal Center achieve no kill status. Austin Animal Center is relying less on Austin Pets Alive than in the past. In 2012, when Austin Animal Center first exceeded a 90% live release rate, it sent 29% of its dogs and 51% of its cats to Austin Pets Alive and other shelters and rescues. Last year, it only sent 21% of its dogs and 27% of its cats to Austin Pets Alive and other organizations. As a result, Austin Pets Alive has been able to assist other Texas shelters since its local animal control shelter truly achieved no kill. Austin Animal Center sent 722 dogs, 139 pit bulls, 172 small dogs and 411 other medium to large size dogs to foster homes. Overall, 7% of all dogs went to a foster home after arriving at Austin Animal Center. Unfortunately, we don’t know how many of these were very short-term fosters, such as overnight breaks from the shelter, to determine how much extra capacity all these foster homes created. However, the data indicated virtually all these dogs were in fact eventually adopted either by the people fostering the dog or another person. Austin Animal Center sent a good number of large dogs into the program. Specifically, significant numbers of both pit bulls and other medium to large size dogs aged four months and older went to foster homes. In other words, people weren’t just fostering cute puppies that the shelter would have quickly adopted out with or without the help of foster homes. Austin Pets Alive has an even larger dog foster program. According to a presentation made during the 2018 American Pets Alive Conference, Austin pets Alive adopted out 2,300 dogs from foster homes and had 671 active dog foster homes as of September 2017. In addition, Austin Animal Center’s dog and cat foster programs doubled the shelter’s capacity per 2016 data from a presentation at a past Best Friends National Conference. Given fostering dogs can eliminate perceived dog behavior problems, significantly increase a shelter’s capacity to hold animals, reduce sheltering costs and bring in adoption revenues, growing foster programs is a huge priority for many progressive shelters. Austin Animal Center also sent many cats to foster homes. Overall, the shelter sent 13% of all cats, 4% of 1+ year old cats, 25% of kittens aged six weeks to just under one year and 5% of kittens under 6 weeks of age to foster homes at some point. While we don’t know how many of these cats were temporary or short-term fosters, the shelter ultimately adopted out nearly every single one of these animals. Austin Pets Alive has an even larger cat foster program. According to a presentation at the 2018 American Pets Alive Conference, Austin Pets Alive places thousands of cats each year in over 650 foster homes. Thus, both Austin Animal Center and Austin Pets Alive, which focuses on making sure Austin Animal Center achieves the highest live release rates, have huge cat foster programs. While Austin Animal Center has attained very high live release rates, local no kill advocates continue to raise the bar. Certainly, Austin Pets Alive has created innovative and groundbreaking programs to save the animals people previously believed were destined for euthanasia. Similarly, the Final Frontier Rescue Project has been advocating for the few remaining dogs being euthanized at Austin Animal Center. In addition, this group rescues many of the most challenging dogs (i.e. the last 1%-2% at risk of losing their lives) Therefore, the no kill movement in Austin continues to improve and pressure Austin Animal Center to do better. That being said, Austin Animal Center is not perfect. The shelter lost three of its shelter directors in the last couple of years. Additionally, there is no doubt that room for improvement exists. Austin Animal Center has continued to improve over the years. While Austin Animal Center benefited from having an amazing rescue oriented shelter, Austin Pets Alive, help, Austin Animal Center has really stepped up its game. You can see some of the innovative programs, such as progressive animal control, breed neutral adoption policies, a large scale foster network, innovative social media use and a huge and effective use of volunteers in this story. As a result of these efforts, Austin Animal Center has effectively limited euthanasia to hopelessly suffering animals and dogs that are truly dangerous. While Austin Animal Center’s success is hard to match, the animal control shelter serving the area just to the north, Williamson County Animal Shelter, also is extremely successful. Despite having a significantly smaller budget per animal than Austin Animal Center (approximately 50% less after adding an estimated $200 per animal to Williamson County Animal Shelter’s budget for animal sheltering only) and receiving less rescue support for both dogs (Austin Animal Center: 21% of outcomes; Williamson County Animal Shelter: 7% of outcomes) and cats (Austin Animal Center: 27% of outcomes; Williamson County Animal Shelter: 5% of outcomes), Williamson County Animal Shelter came close to reaching Austin Animal Center’s live release rates for dogs (Austin Animal Center: 98.8%; Williamson County Animal Shelter: 98.1%) and cats (Austin Animal Center: 95.6%; Williamson County Animal Shelter: 92.0%). Williamson County Animal Shelter also had very impressive adoption numbers. While Austin Animal Center’s per capita adoption rates of 3.9 dogs and 2.5 cats per 1,000 people are good, Williamson County Animal Shelter’s per capita adoption rates of 4.9 dogs and 4.7 cats per 1,000 people are even higher. This is reflected in the Williamson County Animal Shelter’s short average length of stay figures (dogs: 8.8 days, cats: 11.6 days). The key point is that Austin Animal Center is not unique. Since an animal shelter taking in 6,371 dogs and cats in fiscal year 2018 (i.e. almost as many animals as the largest New Jersey animal shelter) next door to Austin can achieve similar success, this proves Austin Animal Center was not taking homes away from animals in nearby areas. If anything, Austin’s animal shelters and Williamson County Animal Shelter likely spurred innovation at facilities in both communities through raising standards and learning from each other. New Jersey animal control shelters can achieve similar success. In 2017, Associated Humane Societies, New Jersey’s largest animal sheltering organization, took in an estimated $1,194 of revenue per dog and cat impounded based on the Associated Humane Societies June 30, 2017 Form 990 and its reported animal intake during 2017. As a comparison, Austin Animal Center had a budget of $884 per dog and cat and Williamson County Animal Shelter only had a budget of $463 per dog and cat and $538 of total revenue per dog and cat after adding $200 per dog and cat for animal control services (shelter does not pick up animals). Thus, New Jersey’s largest animal welfare organization takes in more money per dog and cat yet its Newark facility is high kill and had horrific state health department inspection reports. Clearly, shelters like Austin Animal Center and Williamson County Animal Shelter prove most animal control shelters can achieve high live release rates and attain real no kill status (i.e. only euthanize hopelessly suffering and truly dangerous dogs). The time for excuses has stopped and its now time for action. In 2016, I wrote a series of blogs on the regressive Bergen County Animal Shelter. Part 1 highlighted the shelter’s high kill rate in 2015 despite the facility claiming it was “no kill.” Part 2 examined the absurd reasons Bergen County Animal Shelter used to justify this killing. Part 3 discussed the shelter’s poor policies and how it could change them to improve. Last year, I wrote two blogs on the Bergen County Animal Shelter. The first blog detailed Bergen County Animal Shelter’s 2016 statistics for dogs and cats coming in from the town of Kearny. Sadly, the shelter’s Kearny statistics revealed the facility killed many dogs. Additionally, despite having a successful TNR program, Bergen County Animal Shelter still killed healthy and treatable cats. Later in the year, I found these trends also applied to all the municipalities Bergen County Animal Shelter serviced in 2016. Was Bergen County Animal Shelter still a high kill facility in 2017? What kinds of animals lose their lives at this shelter? Does the shelter comply with state law? Bergen County Animal Shelter continued to kill many dogs in 2017. You can view all the shelter’s dog and cat intake and disposition records here and here. Overall, 13% of all dogs, 31% of pit bulls, 5% of small dogs and 14% of other medium to large sized breeds lost their lives at the Bergen County Animal Shelter during the year. As a comparison, only 1% of all dogs, 1% of pit bulls, 2% of small dogs and 2% of other breeds lost their lives at Austin Animal Center in 2017 despite that shelter taking in many more dogs in total and on a per capita basis. If we just count dogs who Bergen County Animal Shelter had to find new homes for (i.e. excluding dogs reclaimed by their owners), 23% of all dogs, 50% of pit bulls, 10% of small dogs and 21% of other medium to large sized breeds were killed or died at the shelter. To put it another way, around 1 in 4 nonreclaimed dogs, half of nonreclaimed pit bulls and more than 1 in 5 nonreclaimed other medium to large size breeds lost their lives at the Bergen County Animal Shelter. Thus, all types of medium to larger size dogs entering the Bergen County Animal Shelter had a significant chance of losing their life. Bergen County Animal Shelter hardly adopted out any dogs. Despite being a well-known county shelter in a high traffic area, the facility only adopted out 196 dogs during the year or around one dog every two days. Furthermore, 98 of those adoptions were small dogs, which shelters have to do little work to adopt out. Bergen County Animal Shelter only adopted out 98 medium to large size dogs, which included just 34 pit bulls and 64 other medium to large size breeds. This works out to less than three pit bull adoptions and around five other medium to large size breed adoptions a month. The shelter also sent very few medium to large size dogs to rescues. While my recent dog report card blog on the state’s shelters showed Bergen County Animal Shelter had plenty of space to adopt out all of its nonreclaimed dogs, one would think the facility would at least try to send dogs it was going to kill to rescues instead. In fact, Bergen County Animal Shelter only sent 40 out of 326 medium-large size dogs to rescues in 2017. Even worse, Bergen County Animal Shelter only transferred 4 out of 127 pit bulls to rescues during the year. In fact, Bergen County Animal Shelter killed 10 times more pit bulls than it sent to rescues. As a comparison, Elizabeth Animal Shelter sent 29 pit bulls to rescues in 2017 or seven times as many as Bergen County Animal Shelter. Despite the shelter’s policy of contacting rescues prior to killing, I’ve personally never seen Bergen County Animal Shelter ever make a public plea to rescues to save dogs the shelter was going to kill. Thus, Bergen County Animal Shelter would rather kill medium to large size dogs than actually ask for help to save these animals. The following table illustrates how few dogs the shelter sent to rescues. As you can see, almost all the rescues pulled less than ten dogs for the entire year. Furthermore, the rescues pulling the most dogs did not save any pit bulls. Even worse, every single one of the pit bulls rescued on this list went to other shelters. This suggests Bergen County Animal Shelter made little effort to reach out to rescues to save these types of dogs. Bergen County Animal Shelter took too long to adopt out dogs. Overall, the average length of stay was 25 days for all dogs, 27 days for pit bulls, 21 days for small dogs and 30 days for other medium to large size breeds. Despite killing many dogs, sending few dogs to rescues and hardly adopting out dogs (i.e. the dogs the facility adopted out were likely the cream of the crop), the shelter took on average a very long 47 days to adopt out its dogs. Similarly, Bergen County Animal Shelter took 60 days, 39 days and 52 days to adopt out its pit bulls, small dogs and other medium to large size breeds. As a comparison, other successful shelters adopt out dogs, pit bulls in particular, at a much quicker rate despite having to place animals with more issues due to these facilities’ high live release rates. Oregon’s Greenhill Humane Society adopted out its pit bulls about 50% more quickly than Bergen County Animal Shelter. Similarly, Austin Animal Center, which took in a similar percentage of pit bulls and a much smaller percentage of small dogs, adopted out its dogs in around 10 days in 2016. In other words, Bergen County Animal Shelter took nearly five times longer to adopt out its dogs than Austin Animal Center. Thus, Bergen County Animal Shelter adopted out few dogs and took too long to do so. The shelter also took too much time to send dogs to rescues. Specifically, Bergen County Animal Shelter took on average 42 days to send each dog to a rescue. While the shelter did not take long to send pit bulls to rescues on average, the facility sent too few of these dogs to rescue to make this a meaningful number. The shelter took on average 43 days and 45 days to send each small dog and other medium to large size breed to rescues. As a comparison, the Elizabeth Animal Shelter took on average 14 days, 6 days and 15 days to adopt out/send to rescues (almost all were sent to rescues rather than adopted out) its dogs, small dogs and other medium to large size breeds. In other words, Bergen County Animal Shelter took approximately three to seven times longer to send its dogs to rescues than the Elizabeth Animal Shelter. Therefore, even though Bergen County Animal Shelter sent few dogs to rescues, it still took way too much time to do so. Bergen County Animal Shelter’s cat statistics in 2017 were also not good. Overall, 16% of cats lost their lives or went missing. If we just count cats the shelter had to find new homes for (i.e. excluding owner reclaims and cats “released” through TNR and other programs), 20% of these cats lost their lives or went missing. Thus, cats were not safe at Bergen County Animal Shelter. While I tabulated the cat statistics by age, I could not include them due to inaccuracies I noted. Specifically, the shelter had a very large number of cats with an age of zero days in their intake and disposition records report. However, when I obtained underlying records for a sample of these cats, I found a lot of these animals were different ages. Therefore, I could not conduct this analysis by age as I typically do. Bergen County Animal Shelter’s cat statistics were also much worse than Austin Animal Center. While 16% of cats and 20% of nonreclaimed cats lost their lives at Bergen County Animal Shelter in 2017, only 5% of cats and 6% of nonreclaimed cats lost their lives at Austin Animal Center in 2017. Thus, Bergen County Animal Shelter’s cats were three times more likely to lose their lives than cats at Austin Animal Center. Bergen County Animal Shelter took too long to adopt out its cats. Overall, the shelter’s average length of stay was 45 days for cats. As a comparison, Colorado’s Longmont Humane Society’s average length of stay for cats over 4 months of age and 4 months and younger in 2016 were 23 days and 27 days (most cats were adopted out). Furthermore, Longmont Humane Society moved its cats quickly out of its shelter through adoption and achieved a 92% cat live release rate (92% for older cats and 91% for 4 months and younger cats). Similarly, Williamson County Animal Shelter in Texas saved 90% of its cats and had an average cat length of stay of just 13 days in its fiscal year 2017. Thus, Bergen County Animal Shelter took too long to adopt out its cats. Bergen County Animal Shelter also took too much time to send cats to rescues. Despite transferring only 9% of its cats to rescues, the shelter took 51 days to send those cats to rescues. As a comparison, the Elizabeth Animal Shelter sent significantly more cats to rescues in 2017 and only took 8 days on average to send those cats to rescues/adopters (almost all went to rescues). Thus, Bergen County Animal Shelter took too long to transfer cats to rescues. Ammo was two year old Australian Cattle Dog originally surrendered to Bergen County Animal Shelter on April 18, 2017 and adopted out on May 17, 2017. Ammo’s original evaluation noted he was a friendly dog, but had minor food guarding issues. On August 3, 2017, Ammo’s adopter returned him to the shelter for allegedly biting a family member. On that day, the owner filled out an owner requested euthanasia form and the shelter killed Ammo on that very same day. Unfortunately, the shelter provided no documentation of the severity of the bite or the circumstances. For example, was the dog provoked or did it involve an avoidable situation (e.g. being close to the dog while it had a bone)? Pursuant to State law (N.J.S.A. 4:19-15.16 a. through l.) all municipalities must have a licensed animal impoundment facility (pound) designated where stray and potentially vicious animals can be safely impounded. Impounded stray animals shall be held at the pound for at least seven days (i.e., 168 hours) from the time impounded before the animal is offered for adoption or euthanized, relocated or sterilized, regardless of the animal’s temperament or medical condition. Animals that are voluntarily surrendered by their owners to licensed pounds or shelters shall be offered for adoption for at least seven days prior to euthanasia or shelter/pound management may transfer the animal to an animal rescue organization facility or a foster home prior to offering it for adoption if such a transfer is determined to be in the best interest of the animal. In practice, the New Jersey Department of Health allows shelters to euthanize animals during the 7 day hold period if both of the following conditions are met as discussed in this section of the New Jersey Department of Health’s July 30, 2009 inspection report on Associated Humane Societies-Newark. Regardless of the severity of the bite, Bergen County Animal Shelter illegally killed an owner surrendered animal before seven days. Simply put, a shelter cannot kill an animal for aggression before seven days unless it is declared vicious by a New Jersey court and such court orders the killing of the dog. Cat ID# 400 was a stray young cat brought to Bergen County Animal Shelter on January 12, 2017. Four days later the shelter gave the cat a medical exam, During the exam, the cat weighed 6.22 pounds, which is a weight that is not unusually low for a stray and young cat (i.e. the cat was not completely emaciated), and gave him an FIV/FELV test. After the cat tested positive for FELV and the shelter labeled him “Feral”, the shelter killed him on the very same day. The shelter provided no documentation that this animal was hopelessly suffering. Frankly, Bergen County Animal Shelter’s actions are outrageous. While FELV is a serious disease, many cats can live happily quite a long time with this disease. That is why shelters, such as Austin Pets Alive, adopt out FeLV positive cats successfully. Thus, Bergen County Animal Shelter illegally killed Cat ID# 400 only four days after he arrived at the shelter. Cat ID# 781 was a four year old male cat initially brought to the shelter for TNR. According to the shelter, the cat had a 4-5 cm wound, but otherwise was generally pretty healthy. For example, the cat weighed 11 pounds. However, this cat had a positive result on an FIV snap test on the day the animal arrived at the shelter. Despite many shelters successfully adopting out FIV positive cats, Bergen County Animal Shelter killed Cat ID# 781 on the day he arrived at Bergen County Animal Shelter stating the person bringing the cat to the shelter couldn’t keep the pet segregated and as an inside pet. Clearly, Bergen County Animal Shelter illegally killed a cat who was not hopelessly suffering before seven days. Given we know behavior evaluations in shelters are completely inaccurate, the shelter’s decision to kill this dog for acting like a big puppy, guarding a rawhide and showing non-violent protective behavior during a stressful evaluation is absurd. Even worse, the shelter refused to even attempt to modify these so-called behavior problems. In other words, Bergen County Animal Shelter killed Beast for no good reasons. Lana was three year old Labrador retriever surrendered to the Bergen County Animal Shelter by a rescue called Pitter Patter on January 24, 2018. Apparently, the rescue’s full name is Pitter Patter Puppy House. Initially, the rescue surrendered the dog to the shelter in November and then reclaimed the animal. In January 2018, Pitter Patter surrendered the animal for good. According to the shelter, Pitter Patter surrendered Lana because of “unprovoked aggression to other dogs.” However, Bergen County Animal Shelter’s own evaluation found Lana had no issues with people, veterinarians and groomers. Despite being fine with people, Bergen County Animal Shelter killed Lana three days on February 10, 2018 after her so-called evaluation. How any “rescue” can surrender a dog, let alone for dog aggression, to a high kill shelter is beyond reprehensible. Onyx or Dog ID# 889 was an 11 month old dog surrendered to the Bergen County Animal Shelter on March 23, 2017 due to the owner having housing issues and not having the money to afford a boarding facility. According to Onyx’s owner, Onyx lived with the family since he was three months old. The owner stated they spent time everyday training Onxy, playing with him and walking him. In addition, Onyx’s owner stated the dog had no moderate or severe behavior issues. Additionally, the owner stated Onyx was crate trained, friendly with strangers, good with kids and dogs, trained and walked well on a leash. Despite the owner clearly indicating Onyx was a wonderful dog, Bergen County Animal Shelter’s staff viewed Onyx as a terrible dog. According to Onyx’s evaluation on March 28, 2017, he “PULLED EXTREMELY HARD” when taken out of the kennel, exhibited various jumpy/mouthy behaviors, and was “obsessed” with his toy. In other words, Onyx was a big puppy, which the shelter even admitted in its evaluation. Despite Onyx being an overgrown puppy, Bergen County Animal Shelter decided to kill him on May 17, 2017 due to these so-called problems not improving. Miraculously, the shelter claimed Onyx was not a “safe adoption candidate” due to his strength and energy even though he was great with his prior family. To make matters worse, the shelter claimed they had no rescues to place their pit bulls even though the facility does not seem to make public pleas to such organizations. Bergen County Animal Shelter killed Onyx the day after the shelter’s evaluator condemned him to death. Heaven was a two year old female cat surrendered to Bergen County Animal Shelter on January 25, 2017 due to her owner having cancer. According to the owner, Heaven was litter box trained, liked to be petted, enjoyed scratching posts and was an indoor cat. Given the owner was going through a crisis in their life and this cat seemed like a nice pet, you would think Bergen County Animal Shelter would make every effort to save this animal. Bergen County Animal Shelter used its absurd cat temperament tests to kill Heaven. Like dog behavioral evaluations, these tests, which deliberately stress out cats to provoke a bad response, are discredited due to their inaccuracy. Heaven passed a behavioral evaluation given to her four days after she arrived at the shelter. She received a score of 9 points on a scale where under 10 points results in placement anywhere on the adoption floor. Apparently, Bergen County Animal Shelter wasn’t happy with saving a cancer patient’s cat since the shelter tested Heaven again on February 24, 2017. Despite this test finding Heaven approaching the evaluator in a friendly manner and not bothered by petting, the tester complained Heaven hissed, swatted and bit when she was picked up. As many cat owners know, some cats just don’t like being picked up, particularly when they are stressed. Heaven scored 16 points on this test and was placed in a middle grade of the test’s scoring scale, 11-16 points, which resulted in the shelter placing her in Cat Room 2. Bergen County Animal Shelter then tested Heaven again on March 9, 2017, putting her though the abusive provoking exercises once more, and failed her this time. Why? Apparently, after being harassed in several tests, Heaven was afraid/hiding when the people torturing this poor cat sat next to her. Bergen County Animal Shelter killed Heaven four days later. The Bergen County Health Department runs the Bergen County Animal Shelter and inspects itself. As expected, the Bergen County Health Department gave itself a “Satisfactory” grade in 2017. The inspection report, which contained illegible handwriting, looked like someone spent two minutes preparing it. Most noteworthy, the inspector completely missed the animals Bergen County Animal Shelter illegally killed before seven days. Bergen County Animal Shelter should not have had a license to operate for more than five months in 2017 and at least four months and counting in 2018. Under N.J.S.A. 4:19-15.8(b), a shelter’s license expires on June 30th each year. N.J.A.C. 8.23A-1.2 requires a shelter to comply with state law and receive a Certificate of Inspection for the current licensing year. In other words, a shelter must be inspected and found to comply with state law by June 30th of each year to have a license to operate. Furthermore, Teterboro’s municipal clerk told me in the email below that the county health department has not inspected Bergen County Animal Shelter as of November 6, 2018 and may not inspect the shelter until next year. Thus, Bergen County Animal Shelter should not have had a license to operate for more than five months in 2017 and should not have a license to operate the shelter as of November 6, 2018. Sadly, Bergen County Animal Shelter continues to fail the animals entrusted in its care. Despite its $2,117,725 budget or $850 per dog and cat impounded, Bergen County Animal Shelter continues to kill large numbers of its animals. As you see in the table below, Bergen County Animal Shelter receives more government funding per impounded animal than Austin Animal Center and kills dogs at rates ranging from 5-25 times more than Austin Animal Center. Similarly, Bergen County Animal Shelter kills cats at over three times the rate as Austin Animal Center. Thus, Bergen County taxpayers are getting ripped off by this failing animal shelter. Clearly, Bergen County continues to operate a regressive animal shelter. As I discussed previously, Bergen County residents should be outraged that their tax dollars support a high kill shelter that conducts illegal activities and their elected leaders tried to deceive their constituents into believing it was “no kill.” If you live in Bergen County, please contact the following elected representatives and tell them you expect Bergen County to hire a top notch shelter director who will adopt the 11 step No Kill Equation and achieve live release rates well over 90% like Austin, Texas and hundreds of other communities have. In a blog from earlier this year, I disclosed New Jersey’s depressing animal shelter statistics. This blog explains why so many dogs are losing their lives in the state’s animal shelters and whether these facilities can end the killing. In order to assess how good of a job New Jersey animal shelters are doing, I’ve developed an analysis I call the “Life Saving Model.” While shelter performance is dependent on many variables, such as finances, facility design, local laws, etc., the most critical factor impacting potential life saving is physical space. Without having enough physical space, a shelter might not have enough time to find loving homes for its animals. Shelters can overcome financial limitations through creative fundraising or recruiting more volunteers. Similarly, organizations can save their dogs despite having run down facilities if these groups enthusiastically implement policies to get animals into loving homes quickly. As a result, my analysis focuses on making the best use of space to save the maximum number of New Jersey and nearby states dogs. The Life Saving Model measures the number of local animals a shelter should adopt out, rescue from other facilities, send to rescues or other shelters, and euthanize. The targeted outcomes take into account each facility’s physical capacity and the number and types of dogs the organization receives from its community (i.e. strays, owner surrenders, cruelty/bite cases). I assume a target euthanasia rate, take the number of dogs actually returned to owners and then estimate how many community dogs a shelter should adopt out. To the extent space runs out, I then calculate how many dogs the shelter must send to rescues. If the shelter has excess space after properly serving its local community, the facility uses that room to rescue and adopt out dogs from nearby areas. The targeted results calculated from this model are compared to the actual or estimated actual results from each shelter below. For shelters with animal control contracts, I place 10% of all dogs that are not reclaimed by owners into the targeted sent to rescue category. Austin Pets Alive used data from Austin Animal Center, which is the local municipal shelter, to determine large dogs with behavioral challenges are part of the last 10% of animals losing their lives. While shelters can save most of these dogs through behavioral rehabilitation and/or foster programs, I decided to put an estimate of these dogs into the sent to rescue category since that is another good outcome for these dogs. My analysis puts a cap on the targeted numbers of dogs rescued from other shelters and adoptions. While my unmodified targeted numbers of rescued and adopted animals are quite achievable, I want to provide very conservative goals for New Jersey animals shelters. For example, the unmodified model resulted in a statewide per capita dog adoption rate of around 30% to 70% of the level found at some of the nation’s best animal control shelters. Similarly, the unmodified model yielded a statewide pit bull per capita adoption rate (2.0 pit bulls per 1,000 people) that is less than the pit bull per capita adoption rate at one of the best animal control shelters in the country. In my opinion, New Jersey shelters could more easily achieve that per capita pit bull adoption rate given my model includes far fewer dogs from competing breeds than those in this role model animal control shelter. In simple terms, a shelter is expected to achieve this per capita adoption rate unless the facility lacks enough space. If a shelter does not have sufficient room, it won’t have the time to reach all the potential adopters and requires assistance from rescues and/or other facilities. Given my model assumes 80% of rescued dogs are pit bull like dogs, my targeted numbers of dogs rescued and adopted are quite low as detailed in the section below. For example, shelters in counties where dog adoptions are capped have extra space that they do not use to adopt out other dog breeds. New Jersey’s animal shelter system has enough space to save all of the state’s healthy and treatable dogs. The table below details the targeted numbers of dog outcomes the New Jersey animal shelter system should achieve. Out of the 22,391 New Jersey dogs coming into the state’s animal shelters in 2017, 10,928 and 1,590 dogs should have been adopted out and sent to other shelters/rescues by the facilities originally taking the dogs in. However, other New Jersey animal shelters had more than enough capacity to rescue the 1,590 dogs from space constrained facilities. Thus, New Jersey animal shelters should be able to able to adopt out every single healthy and treatable dog taken in from the state and not require any support from rescue organizations without physical facilities from a space perspective. Additionally, New Jersey animal shelters could save another 7,831 dogs from other locations outside of the state. Of course, some New Jersey animal shelters do pull some dogs from New York City and Philadelphia animal control shelters. However, most of these dogs are likely easy to adopt and therefore have short lengths of stay. As a result, the additional number of dogs New Jersey animal shelters could save from New York City, Philadelphia and elsewhere is probably not much lower than the figures above. Thus, New Jersey animal shelters could make New Jersey a no kill state for dogs as well as many other places. Thus, many communities are already adopting out around two to four times as many dogs as the goal set for New Jersey animal shelters. Some naysayers may claim New Jersey would have a more difficult time due to the state’s shelters taking in many pit bulls. However, this is a myth. My model estimates New Jersey animal shelters would need to adopt out roughly 0.5 pit bulls per 1,000 people to save 95% of New Jersey’s dogs. Our shelters would only need to adopt out around 1.4 pit bulls per 1,000 people if New Jersey shelters also rescued and adopted out the targeted number of pit bulls from other states. As a comparison, I estimate Longmont Humane Society adopts out 2.2 pit bulls per 1,000 people based on the number of pit bulls impounded in 2014 as a percentage of total dogs impounded in 2014 and multiplying that number by the 10.5 dogs per 1,000 people adoption rate in 2017. Furthermore, the pit bull adoption targets are even more reasonable given the model assumes there are roughly 1/8 of the number of dogs from other breeds to compete with in the New Jersey adoption market compared to the Longmont, Colorado area. The tables below detail the estimated dog death rates. All dogs missing are assumed “dead” based on the assumption they died or went to a very bad place. As discussed in a prior blog, the estimated death rate includes “Other” outcomes as animals who died or went missing along with dogs reported as killed. Based on my review of a number of shelters’ underlying documents, virtually all of the dogs in the “Other” outcome category died or went missing. Shelters having estimated dog death rates equal to or less than and greater than 5% are highlighted in green and red in the table below. The Humane Society of Atlantic County and St. Hubert’s-Noah’s Ark had unusually high estimated dog death rates of 11% and 8% (St. Hubert’s estimated death rates reflect an adjustment for the organization’s Sister Shelter Waystation program discussed in this blog). These facilities’ estimated death rates are very high for rescue oriented shelters with no animal control contracts and raise serious questions about how life and death decisions are made by these organizations. The estimated death rates at other rescue oriented shelters, such as Ramapo-Bergen Animal Refuge and Animal Welfare Association (both had estimated dog death rates of 1%) are much lower than the Humane Society of Atlantic County and St. Hubert’s-Noah’s Ark. Thus, the Humane Society of Atlantic County’s and St. Hubert’s-Noah’s Ark’s estimated dog deaths rate are extremely high for rescue oriented shelters. When we calculate this estimated local death rate, a number of shelters stand out. The Humane Society of Atlantic County’s estimated dog death rate rises from 11% to 21% under this calculation. Additionally, St. Hubert’s-Madison’s estimated dog death rate increases from 10% to 48% under this calculation. While these facilities may not be only killing local dogs and therefore may have lower local dog death rates, I think its very possible these shelters’ local dog death rates are significantly higher than their total estimated dog death rates in the tables below. Thus, the bulk of the dogs unnecessarily dying at New Jersey animals shelters occurs at a small number of facilities. Some animal shelters will require more support from rescues and animal shelters with excess space than others. If a shelter has relatively high intake, very limited space, and few stray dogs returned to owners, it will need more help than other shelters. In an ideal world, rescues would take all shelter animals. However, due to limited numbers of foster homes, lesser ability to find foster homes due to many rescue organizations’ small sizes, and most rescues’ restrictive adoption policies, all shelters cannot heavily rely on rescues. The tables below compare the number of dogs a shelter should transfer to other organizations per the model and the number of dogs actually sent to other animal welfare groups. Shelters marked in green are receiving less than the expected rescue support while facilities marked in red are receiving too much rescue help. Overall, most New Jersey animal shelters require little rescue support if space-constrained facilities fast-track their most highly adoptable dogs. Shelter medicine experts advocate prioritizing the processing of highly adoptable animals to make the best use of space and reduce disease. For example, making sure these animals are the first to get spayed/neutered and vaccinated and receive microchips to ensure they can leave as soon as the shelter finds a good home. 54 shelters received too much help, 17 facilities received just enough assistance and 22 shelters received too little help from other animal welfare organizations. However, the excess dogs rescued (1,743 dogs) at shelters receiving too much assistance was far higher than the rescue deficits at other shelters (232 dogs) resulting in the state’s shelters sending 1,511 more dogs than needed to rescues and other animal welfare organizations. Northern Ocean Animal Facility and Southern Ocean Animal Facility received less rescue support than needed. However, neither of the shelters reported rescues taking any animals, which raises questions as to whether these shelters correctly reported their data (i.e. counting animals sent to rescues as adoptions). Nonetheless, the New Jersey shelter system as a whole is receiving enough rescue assistance, but some shelters are hurt by rescues pulling animals from less needy facilities. Rescue groups and shelters with extra space should pull dogs from kill shelters with the highest rescue “target” numbers and deficits in the tables below. If shelters not needing rescue support get that extra help, these shelters will not take the steps necessary to properly run their facilities. As a result of enabling poorly performing shelters and not pulling dogs from truly space constrained facilities, rescuing dogs from shelters with enough space leads to less lifesaving. Given killing animals for space is intolerable, the space-constrained shelters need to expand their effective dog capacity. These facilities could use extra space in their buildings to house dogs on a short-term basis. These shelters can enter into arrangements with local veterinarians to house and adopt out some dogs. Furthermore, shelters can create or expand foster programs to increase the number of dogs cared for. Additionally, creating a pet owner surrender prevention program, implementing a proper managed intake policy (i.e. where animals are impounded when in danger and waiting periods for owner surrenders are relatively short) and making serious efforts to return lost dogs to owners could free up space in these shelters. Finally, space-constrained shelters with multiple animal control contracts should terminate some of these arrangements to bring their capacity for care in line with the number of dogs they take in. As a result, space constrained shelters still need to take active steps to reduce killing rather than simply solely relying on rescue support. In certain circumstances, it may make sense for shelters with excess space to send dogs to rescues. For example, a unique breed or a dog needing very specialized behavioral or medical rehabilitation. However, these cases are accounted for in my targeted sent to rescue figures for animal control shelters. The tables below compare the number of dogs from New Jersey and nearby states each animal shelter should adopt out with the estimated number of local dogs actually adopted out. Many rescue oriented shelters likely pull much easier to adopt dogs than the bulk of dogs needing to get rescued from local facilities. Thus, the results from rescue oriented shelters may look better than they actually are. Few organizations reached or exceeded their adoption targets. Specifically, only 10 out of 93 shelters met the adoptions goals computed by the Life Saving Model. Thus, the overwhelming number of New Jersey animal shelters need to step up their adoption efforts. A number of other rescue oriented shelters exceeded their adoption targets, but this may at least partially be due to the types of dogs they impounded. Common Sense for Animals operates more like a rescue oriented than an animal control shelter. While this organization exceeded its adoption targets, the shelter’s figures were off by 128 dogs using the methodology outlined in another blog. This makes me wonder if their adoption numbers were accurate. Somerset Regional Animal Shelter, which also operates more like a rescue oriented shelter than an animal control facility, exceeded its adoption target. However, this shelter appears to mostly rescue easier to adopt dogs from New Jersey animal shelters. Other rescue oriented shelters, such as Mt. Pleasant Animal Shelter and Animal Welfare Association also exceeded their adoption targets, but this is likely due to these organizations rescuing easier to adopt dogs from New Jersey shelters. Thus, I believe most of these rescue oriented shelters’ high local dog adoption numbers were due to these organizations selecting easier to adopt dogs. Pequannock Animal Shelter’s higher than targeted local dog adoption result is a bit misleading. This facility benefited from the method I used to cap adoptions in the county and reduce the adoption targets for these two shelters. For example, the shelter only reached 61% of its adoption target using my unadjusted model only taking the shelter’s physical space into account. Since Morris County has many shelters that collectively have a very large capacity (i.e. very high adoption potential), my model reduces all Morris County animal shelters’ target adoptions to my county adoption cap. Therefore, Pequannock Animal Shelter has a relatively low dog adoption target. Thus, this shelter really didn’t do an excellent job adopting out dogs. Three animal control shelters deserve mentioning. Camden County Animal Shelter exceeded its adoption target by 40 dogs. As a large county shelter that includes a poor urban area, this is an impressive result. Similarly, Burlington County Animal Shelter, which also takes in many dogs, exceeded its dog adoption target by 82 dogs. Ewing Animal Shelter, which is operated by EASEL Animal Rescue League, adopted out 19 more dogs than its adoption target. Unsurprisingly, all three shelters had dog live release rates exceeding 90% in 2017 (Camden County Animal Shelter: 92%, Burlington County Animal Shelter: 96%, EASEL Animal Rescue League: 98%) and all three facilities provide either condensed or full statistics on their web sites. Unsurprisingly, Associated Humane Societies has archaic adoption policies that make it more difficult to adopt than the procedures recommended from national animal welfare organizations. Furthermore, Associated Humane Societies-Newark, Associated Humane Societies-Tinton Falls, Trenton Animal Shelter, Paterson Animal Shelter, Monmouth SPCA, Paterson Animal Shelter and Bergen County Animal Shelter had troublesome stories involving the shelters and/or prominent people affiliated with these organizations over the last several years. Shake a Paw-Union’s low local adoption numbers are not surprising since it also operates a for profit pet store and transports almost all of its dogs it rescues from out of state. Finally, Plainfield Area Humane Society’s local dog adoption deficit is quite disturbing since this organization could easily take on Plainfield’s dogs who currently go to the horrific and high kill Associated Humane Societies-Newark. To further examine New Jersey animal shelters’ performance in saving the state’s homeless dogs, I compared the targeted number of dogs each shelter should pull from nearby shelters and compared it to the number actually rescued from local facilities. I assume all reported out of state rescued dogs came from southern or other far away states (except for Animal Alliance due to the shelter stating it primarily pulls out of state dogs from Pennsylvania). While some of the out of state rescued dogs may have comes from nearby areas, I believe this is a small number and does not significantly impact the results. As mentioned above, many of these shelters local rescue numbers are inflated due to these organizations cherry picking highly adoptable animals to rescue. Thus, nearly all New Jersey animal shelters with targeted excess capacity are failing to do their share in ending the killing of local healthy and treatable dogs. Camden County Animal Shelter also deserves mentioning. This facility rescued 380 dogs from other New Jersey shelters last year. While this is an obviously good thing, this may have artificially decreased this shelter’s estimated local death rate by as much as 2% if it only pulled highly adoptable dogs. The improper allocation of space within the state’s animal shelter system requires organizations to form coalitions. While putting a competent and compassionate director in every shelter would likely be even more effective, that will likely take time to do. No kill coalitions between animal control facilities and selective admission shelters have been used in places, such as Portland, Oregon, Reno, Nevada, Jacksonville, Florida and Austin, Texas to radically increase life saving. Maddie’s Fund, which has supported using coalitions for over a decade, has many resources for organizations seeking to collaborate with each other. Thus, New Jersey animal shelters need to formally work together, develop quantifiable and measurable goals (such as the targeted outcomes in this blog), and hold each organization accountable for meeting these benchmarks. Shelters should examine the reasons why their adoption numbers fall far short of these benchmarks. In some cases, shelters need to expand the hours they are open for adoptions. Many shelters should switch from an overly judgmental adoption process based on black and white rules to a conversational one focused on educating the adopter. Organizations will need to radically increase their off-site events and do same day adoptions. Similarly, many shelters must reduce adoption fees and run frequent promotions. Executive Directors should monitor the latest life-saving programs on Maddie’s Fund’s, ASPCA Pro’s, American Pets Alive Conference’s, and the Best Friends National Conference’s web sites and put some of these policies into place. Shelter management teams will need to ensure their facilities are clean and customers are treated with respect (this can be measured by encouraging the public to complete surveys). Thus, poorly performing shelters need to stop making excuses and do what it takes to reach their adoption potential. Each shelter’s community dog intake (i.e. owner surrenders, strays, cruelty bite cases), number of dogs returned to owners, and maximum dog capacity were taken from its 2017 “Shelter/Pound Annual Report” submitted to the New Jersey Department of Health. Community dog intake and dogs returned to owners were initially estimated for each month by dividing the annual figures by 12. In order to take into account the extra space in low intake months and reduced space in high intake months, we multiply that number by each month’s percentage of the average month. For example, assume 240 dogs were taken in during the year and the average month equals 20 dogs (240/12). In July, the dog intake is 120% higher than the average month and we therefore multiply 20 dogs by 1.2 to equal 24 dogs. If 120 dogs were returned to owners during the year, the estimated number of dogs returned to owners in July would equal 12 dogs (120/12 = 10; 10*1.2). The monthly intake percentages were based off the average of the 2017 dog intake data on New York Animal Care & Control’s and ACCT Philly’s web sites. The number of community dogs euthanized (including animals who died or are missing) is set to equal 5% of intake. 5% is a reasonable standard euthanasia rate for shelters in New Jersey to meet given few vulnerable stray puppies (i.e. who could die or require euthanasia) arrive in the state’s animal shelters. The average length of stay for euthanized dogs is assumed to equal 14.5 days. Half of dogs are assumed euthanized for untreatable aggression towards people and 21 days is the time estimated to make that determination. The other half of dogs are assumed euthanized for severe and untreatable health issues and I estimate these dogs are euthanized after 8 days (subsequent to the end of the stray hold and owner surrender protection periods). Space constrained shelters were assumed to adopt out their easiest to adopt animals first until they ran out of space. To estimate the average adoption length of stay, I used pit bull adoption length of stay data from Greenhill Humane Society from March 2013 through May 2015. I broke the adoption length of stay data into 5 groups that each made up 20% of the data. The average adoption length of stay for each of these 5 groups was calculated. The average adoption length of stay of each group was divided by the average length of stay for all of the adopted pit bulls in the Greenhill Humane Society data set. Those percentages were then multiplied by the average dog adoption length of stay determined in the previous bullet and used to determine the adoption lengths of stay used for space-constrained shelters. Community dogs not returned to owners or euthanized are initially assumed as adopted for each month. However, if the calculated length of stay exceeds the shelter’s required length of stay, dogs are moved from adoption (i.e. longer length of stay) to rescue (i.e. shorter length of stay) until the calculated length of stay each month approximately equals the required length of stay. Animal control shelters have a minimum of 10% of unclaimed dogs go to rescues. To the extent shelters transfer 10% of unclaimed dogs to rescues despite having space (i.e. reclassifying dogs from adoptions with a longer length of stay to rescues with a shorter length of stay), I do not require these facilities to use that space to rescue additional dogs. Shelters with excess capacity are assumed to use the extra space to rescue and adopt out dogs from other New Jersey animal shelters. To the extent all healthy and treatable New Jersey animal shelter dogs are saved, I assume additional dogs are pulled from nearby states with similar types of dogs. I assume all rescued dogs will not be killed since the transferring and receiving shelters should evaluate these dogs’ behavior. Based on pit bull type dogs having longer lengths of stay at shelters, I assume 80% of dogs rescued from local animal shelters are pit bulls and 20% are non-pit bulls. 80% and 20% of pit bull and non-pit bull type dogs are considered 1 year and older and under 1 year. The average length of stay for rescued pit bulls and other dogs are the same as the adoption length of stay figures above. The targeted number of dogs rescued and adopted were capped at 2 pit bulls per 1,000 people in each county. If the model yielded a higher result than this cap, the targeted numbers of dogs adopted were set to equal to this cap using the pit bull percentage assumptions above. For shelters in these counties (except Passaic County), I calculated the cap at the county level and then reduced the number of cats adopted for the county to equal the cap. I excluded West Milford from Passaic County due the town’s large distance from the population centers in the rest of the county. Each shelter’s percentage of total targeted adoptions in the county from the unmodified model were applied to the the total reduction in the number of adoptions in the county to yield the targeted numbers of dogs adopted in the modified model. If the shelter also rescued animals from other shelters, the rescued numbers were also reduced since I assume rescued animals are adopted. In my last blog, I discussed Clifton Animal Shelter’s senseless killing of healthy and treatable animals. That blog detailed Clifton Animal Shelter routinely breaking state law when it killed animals during the state’s seven day protection period. Did Clifton Animal Shelter break other laws during 2017? Clifton Animal Shelter’s euthanasia records do not specify how the shelter killed or euthanized animals as required by state law. Specifically, the records do not state whether the shelter euthanized/killed each animal by an intravenous (preferred method), intraperitoneal or intracardiac (i.e. heart sticking) injection. Per New Jersey law, shelters can only use intraperitoneal injections on comatose animals and neonatal kittens. Under this method, animals are injected in the abdominal cavity and can take up to 30 minutes to die. Heart sticking, as the name implies, involves stabbing an animal in the heart with Fatal Plus poison and New Jersey shelters can only use this method on heavily sedated, anesthetized or comatose animals. 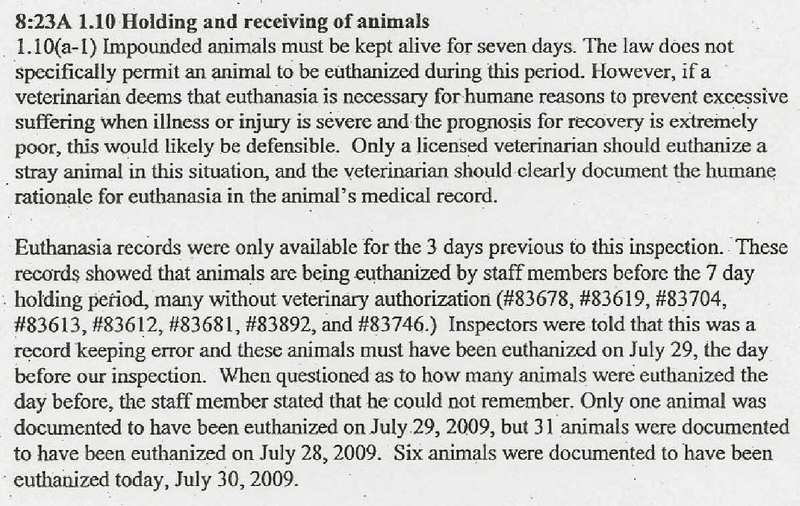 Thus, Clifton Animal Shelter’s euthanasia records do not indicate whether animals are in fact humanely euthanized. To make matters worse, Clifton Animal Shelter’s records indicated the facility did not even weigh animals prior to killing them. In other words, the shelter could have not provided enough sedatives to calm the animals and not enough euthanasia drugs to kill them. Therefore, animals could have experienced stress and pain during the procedure and then may have been dumped or put into an incinerator while still alive. Clifton Animal Shelter also used excessive doses of Ketamine. The shelter administered 1.0 to 2.0 milliliters of Ketamine to virtually every adult cat it killed. The product label states 1 milliliter of the Ketamine drug contains 100 milligrams of the active Ketamine ingredient. In addition, the product label states cats requiring restraint should receive a dose of 5 milligrams/pound of cat. The product label also states veterinary personnel should use a dose of 10-15 milligrams/pound of cat to produce anesthesia. Based on most cats weighing 8 pounds, that means the cats should have only received 40-120 milligrams or 0.4-1.2 milliliters of the Ketamine drug. In other words, Clifton Animal Shelter provided doses of up to five times greater than the label indicates. Given large doses can “produce convulsions and seizures”, this indicates many animals could have experienced agony prior to their killing. To make matters worse, Clifton Animal Shelter had no records showing how it used another sedative, Xylazine, despite the facility purchasing significant quantities of this drug. While the shelter is not required to keep controlled dangerous substance logs of Xylazine under existing law, the facility must detail how much of this substance it gave to animals it killed under N.J.A.C 8.23A-1-11(f)(4). Thus, Clifton Animal Shelter either broke state law by not recording its use of Xylazine, violated the Open Public Records Act by not providing the records I requested or spent $456 on drugs it didn’t use. If this was not bad enough, Clifton Animal Shelter violated New Jersey’s controlled dangerous substance law by having Ketamine at the shelter. As you can see here, Ketamine is a Schedule III Controlled Substance. Per the New Jersey Department of Consumer Affairs, animal shelters cannot have Ketamine at their shelters unless the controlled substance is the property of the veterinarian. As the invoice above shows, Parkview Animal Hospital sold Ketamine to Clifton Animal Shelter. Furthermore, Clifton Animal Shelter does not have an in-house veterinarian. Therefore, the shelter illegally kept Ketamine in the facility. The Clifton Health Department inspected Clifton Animal Shelter on July 25, 2017 and found serious issues. You can read the full inspection report here. The shelter’s dog kennel area had rodent droppings and the dogs likely had the rodents enter their enclosures. How did the rodents likely get into this area? The shelter had holes in the floors and open containers of dog food. Therefore, the shelter effectively lured rodents into the facility with open containers of food and gave the rodents a clear path inside by leaving holes in the floors unfixed. Clifton Animal Shelter did not have a legally required isolation area. Under N.J.A.C. 8.23A-1.9(g), N.J.A.C. 8.23A-1.9(h) and N.J.A.C. 8.23A-1.9(i), a shelter must have a separate isolation area. What did the shelter use instead? A bathroom that the animal control officer claimed had a separate ventilation system. Call me crazy, but I’m highly skeptical that a facility which can’t fix holes in the floor and leaves food containers open would build a separate ventilation system for its bathroom. Regardless of the ventilation system, a bathroom is too small to serve as isolation room and presents other challenges if people also use the bathroom. For example, people coming in and then spreading disease to the rest of the facility. Thus, Clifton Animal Shelter lacked one of the key required features of an animal shelter. The shelter did not have a scale to weigh animals. This finding confirms my suspicion, which was based on the shelter not listing weights of the animals it killed and euthanized, that the facility did not weigh animals prior to killing animals. Therefore, Clifton Animal Shelter could have easily provided excessive doses of Ketamine, which can “produce convulsions and seizures”, and/or not provided enough Fatal Plus to ensure animals were actually dead. As a result, Clifton Animal Shelter could have easily dumped animals in a landfill or placed pets into an incinerator who were still alive. Clifton Animal Shelter also was not open the required hours according to the signs on its doors at the time. Under N.J.AC. 8.23A-1.10(b)(1), a shelter must be open at least two hours each weekday and two hours on Saturday or Sunday. However, the shelter’s signs said it was only open one and a half hours each weekday. While the signs on the shelter’s door now indicate Clifton Animal Shelter is open long enough to meet state law requirements, the facility is hardly ever open to adopters. Specifically, the shelter is only open from 6:30 pm to 8:30 pm Monday to Friday and Sunday from 12 pm to 4 pm. In other words, the shelter is only open on average two hours each day. Furthermore, the facility is closed on Saturdays (except for appointments) despite people adopting many animals on this day at other shelters. The shelter also lacked a disease control program that was certified by its supervising veterinarian. Given having a disease control program certified by a licensed veterinarian is extremely important and required by state law, this is a serious problem. While the shelter did have a veterinarian certify its disease control program in 2018, the actual program did not provide adequate detail, particularly regarding different types and ages of animals as well as addressing the mental health and “stress” of animals as required by N.J.A.C. 8.23A-19(d)(2). Despite all these significant problems plus the shelter illegally killing animals before seven days, the Clifton Health Department remarkably gave Clifton Animal Shelter a “Satisfactory” rating. As regular readers know, local health departments typically are incapable of conducting proper inspections of animal shelters due to incompetence and conflicts of interest. Therefore, a state health department inspection would likely find many more significant problems. The Montclair Health Department inspected Clifton Animal Shelter on July 6, 2018 and also found some problems. During the obviously too short one hour and twenty minute inspection, the Montclair Health Department noted Clifton Animal Shelter had no written euthanasia instructions posted in the facility and its euthanasia records still did not list body weights as required by N.J.A.C. 8.23A-1.11(f). Thus, Clifton Animal Shelter may have continued to kill animals inhumanely in 2018. Given Montclair Health Department’s history of missing obvious violations of state law at its town shelter in the past and having no records of legally required annual inspections in 2010 and 2012, one should assume this was a poor quality inspection. Clifton Animal Shelter should not have had a license to operate for 25 days in 2017 and six days in 2018. Under N.J.S.A. 4:19-15.8(b), a shelter’s license expires on June 30th each year. N.J.A.C. 8.23A-1.2 requires a shelter to comply with state law and receive a Certificate of Inspection for the current licensing year. Thus, Clifton Animal Shelter should not have had a license to operate during 25 days in 2017 and six days in 2018. Finally, both inspection reports confirmed the conclusion from my last blog that Clifton Animal Shelter killed animals with empty kennels. Despite both inspections taking place during a time of the year when shelters are crowded due to high intake, Clifton Animal Shelter only housed 5 dogs and 28 cats during the July 25, 2017 inspection and 6 dogs and 26 cats during the July 6, 2018 inspection. As a comparison, Clifton Animal Shelter reported having a capacity of 16 dogs and 52 cats in its 2017 Shelter/Pound Annual Report. Thus, Clifton Animal Shelter killed animals around the times it only used about one third of its dog capacity and one half of its cat capacity. As I discussed in my last blog, Friends of the Shelter is an organization that controls the volunteer program at the shelter and also has the option to save animals Clifton Animal Shelter plans to kill. According to the shelter’s intake and disposition records, a number of these animals remain at the shelter. As you can see from the emails below, the adoption fees for all the cats and dogs adopted from the shelter during the month of June in 2017 went to Friends of the Shelter and not Clifton Animal Shelter. While the agreement between Friends of the Shelter and Clifton Animal Shelter, which you can find here and here, does require Friends of the Shelter to pay any subsequent costs after the transfer of an animal takes place, I am skeptical that Friends of the Shelter is assuming 100% of the costs given the animals are housed in the city’s shelter. Most importantly, I’m struck between the performance of Friends of the Shelter and EASEL Animal Rescue League. Prior to 2015, when EASEL Animal Rescue League took over managing Ewing Animal Shelter, it also had a similar arrangement to Friends of the Shelter in many respects. However, EASEL Animal Rescue League is a proud no kill organization. We see this difference when we look at the 2014 kill rates of Ewing Animal Shelter and Clifton Animal Shelter. In 2014, Ewing Animal Shelter only euthanized 3% of its dogs and 1% of its cats while Clifton Animal Shelter killed 13% of its dogs and 39% of its cats. Thus, Friends of the Shelter is not performing at the level it should be. While Friends of the Shelter obviously does some good work, their leadership seems behind the times. For example, I could not find an active Facebook page from this group or the animal shelter itself. While a Clifton Animal Shelter Facebook page exists, its “unofficial” and just has information about the facility and reviews (i.e. animals up for adoption are not posted). In 2018, its shocking that any animal shelter or rescue group would not have a Facebook page. The saying “a picture is worth a 1,000 words” perfectly applies to the Clifton Animal Shelter. What do visitors see when they enter the door to the shelter? A sign showing the facility is virtually never open and a threat of imprisonment if the person leaves an animal outside the building. Obviously, this is not welcoming to adopters who walk in the door. Clifton Animal Shelter is not serving the city’s homeless animals and residents well. In 2017, Clifton Animal Shelter impounded just 4.9 dogs and cats per 1,000 people and received $300 per dog and cat impounded from the city. As a comparison, Michigan’s Chippewa County Animal Shelter took in 21.1 dogs and cats per 1,000 people and received just $228 from the government per dog and cat impounded. Clifton Animal Shelter had nonreclaimed animal death rates of 29% for dogs and 19% of cats in 2017 while Chippewa County Animal Shelter had nonreclaimed death rates of 1% for dogs and 2% for cats. Thus, Clifton Animal Shelter’s nonreclaimed dogs and cats lost their lives at 29 times and 10 times the rate as an animal control shelter receiving far more animals on a per capita basis (and in total too) and having significantly less funding from its government. Clifton taxpayers are also spending more money per animal than Ewing’s taxpayers on its animal shelter and killing more animals. According to a recent news article, Ewing pays EASEL Animal Rescue League $150,000 per year to run the shelter. When we add this amount to the town’s $104,750 animal control department budget, Ewing pays $254,750 per year for animal control and its animal shelter. Based on EASEL Animal Rescue League taking in 896 dogs and cats in 2017, Ewing pays $284 per dog and cat. As a comparison, Clifton allocated $176,900 in its 2017 budget to its animal control and sheltering operation. Based on Clifton Animal Shelter taking in 589 dogs and cats in 2017, the town had $300 of funding per dog and cat. In 2017, EASEL Animal Rescue League reported only 2% of noneclaimed dogs and 7% of nonreclaimed cats lost their lives. As a comparison, Clifton Animal Shelter had nonreclaimed death rates of 29% for dogs and 19% for cats. Thus, Clifton taxpayers spent more money than Ewing taxpayers on its animal shelter and its nonreclaimed dogs were 15 times and its nonreclaimed cats were three times as likely to lose their lives. Given the relatively small numbers of animals this shelter takes in, it should achieve great things. With your advocacy and persistence, we can make this change happen.